The Delaware Libertarian: AHA! 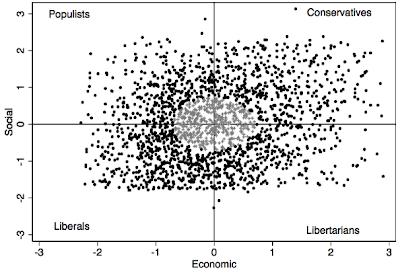 New survey finds that Libertarians outnumber Liberals nationwide! AHA! New survey finds that Libertarians outnumber Liberals nationwide! The core of the argument made at a conference last month at the University of Akron by the political scientists Edward Carmines of Indiana University, Michael Ensley of Kent State University and Michael Wagner of the University of Wisconsin lies in the graphic representation in Figure 1, which shows the distribution of political orientations in the United States. 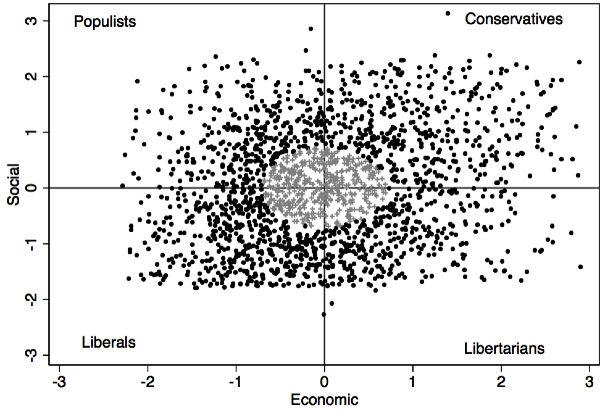 According to their analysis of American National Election Studies poll data from the last 40 years, the electorate is divided into five ideological categories: liberals, who make up 19 percent of voters; conservatives, 27 percent; libertarians, 22 percent; populists, 11 percent; and, in the lighter gray center, moderates, at 21 percent. Of course the bad news is that each of three self-identified Libertarians can always be counted on to explain why the others aren't really Libertarians, which explains why the Libertarian Party never really goes anywhere politically on a national basis. And, of course, Libertarians don't outnumber Liberals in Delaware, but that hardly matters since the corporatist/corrupt mainstream of the Delaware Democratic Party outnumbers everybody else. Do they have any explanation for the seemingly obvious bias in the data? There seems to be a limit at about -1.75 on the Social scale and -2.25 on the Economic scale that only a very few outliers exceed. There is no such boundary on the positive side of the scales.